Everything you need to know about The Witchlands series, plus an interview with author Susan Dennard. The Witchlands is Susan Dennard’s incredibly popular fantasy series set on a magical but unstable continent where war is looming. 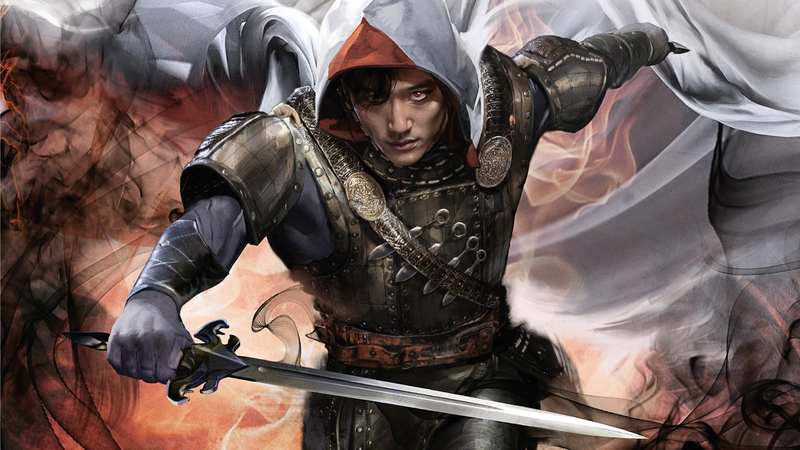 Here, we cover everything you need to know about the series so far, and we interview author Susan Dennard about the series and her writing process. The Witchlands is a three book (so far), New York Times best-selling fantasy series centred around Truthwitch Safiya and her partner in crime Iseult, a Threadwitch. It's set amidst a crumbling truce between three nations and a slew of much more immediate vendettas, and it's uproariously good fun. Here are a few 'must-knows', whether you're poised to join the steadily growing legion of fans or you’re already planning your shrine to #Baeduan after reading the third book, Bloodwitch. The Witchlands has magic woven into the very fabric of society so that it really feels like the world couldn't run without it. Sure, some witches (a non-gendered term here) are more powerful than others, and there are a few surprises up a couple of voluminous sleeves, but it’s refreshing to see magic that is also put to work. Magic falls into elemental buckets that author Susan Dennard claims was inspired by the Avatar: The Last Airbender series; Aether, Void (generally believed to be only a legend), Wind, Fire, Earth and Water. Only in the rarest cases can a witch claim total mastery of their element, but usually they specialise in a certain part of it. Ships for example will have the usual contingent of sailors, but they might also have a Tidewitch to help navigate, and Voicewitches (drawing on Aether magic), commonly found in towns, act as long-range messengers for hire. These limits lead to an interplay of witches and magic that makes for some fascinating relationships and power dynamics. At the heart of the series, and especially the opening novel Truthwitch, is the friendship between Safiya and Iseult. Sure, most novels have some kind of friendship, but the way the strengths and weaknesses of these two protagonists intertwine from page one, and set events in motion, colours the entire book in gripping fashion. Another defining relationship is the one between Safiya and Pirate-prince Merik. Rest assured, it’ll keep you guessing – Dennard commented on romances in novels on Twitter recently, saying she tends to lose interest once a romantic ship has sailed, or is too well defined. At times, Truthwitch resembles a buddy/road-trip movie through a hostile but beautiful landscape, the journey undertaken by people that both love and hate each other. Sounds weirdly realistic actually. The women of The Witchlands are seriously good influences, but that doesn’t mean they’re always ‘nice’. Truthwitch opens with our two protagonists literally performing daylight robbery, after an implied bender in a gambling den. Safiya ends up in a pretty ball-gown at some point – and she makes the most of it – but it’s clear she’s more comfortable in the city streets with Iseult at her back and a sword in her hand. For Iseult’s part, she rebelled against her ordained path as the traditional ‘village healer’ archetype, while still feeling a sense of nostalgia for it. What really makes Safiya and Iseult so refreshing is that, whatever happens, they’re intent on taking control of their own destinies. The Witchlands doesn’t preach about how to be female, or feminine, but it sure as hell shows two very human examples of how to figure it out for yourself. Every good set of heroines needs an equally vibrant antagonist for contrast, and The Witchlands series delivers in the form of Aeduan. A rare bloodwitch and mercenary, Aeduan can track blood-scent across great distances, manipulate his own life-energy for great feats of physical endurance or healing and generally shoot you a terrifying look with his red eyes. And of course, fans now refer to him as #Baeduan. With good reason – the guy is pragmatic yet relatable, sinister yet inadvertently charming. Perhaps what makes him most fascinating is his unpredictability: he has his own peculiar sense of honour and, whatever the situation, he somehow always finds a way to subvert the expectations of everyone around him, forging his own path through events of the book. Danny Wadeson, host of the Uncaring Universe podcast, interviewed The Witchlands series author Susan Dennard, and they chatted about everything from ecological world-building to writing advice. Read the highlights below, or listen to the whole podcast here. I spend a lot of time choosing what trees are around, and, no one's gonna notice, but gosh darnit this forest of alders is accurate! One time I tweeted at Bioware – I was playing Dragon Age Inquisition, and there's one area in the mountains with six dragons living right next to each other. I was like, guys, this isn't how apex predators operate. They have to have ranges! Getting the words on the page is my least favourite part. I love story, I love the planning and the brainstorming and I love revising. But oh man, getting words on the page takes me a long time. And I know that now, but I used to fight it and believe I had to write fast, and write three thousand words every day, but what I'd end up doing is writing terrible words and then have to delete them all later. So I've learned to lean into my style and what works for me. And to figure out what that is. I'll spend many months planning, refilling the well - once I do begin drafting, I go through phases, brainstorming, then the actual outline on whiteboard and index cards, I’ll figure out scene details and then write. And what I’ve found is that I write between 10-15 thousand words and then I peter out. What I mean by that is, getting into this feeling of it being like pulling teeth - so then I'll go back and put on my inspirational music, walk the dogs, spend a few days thinking and figure out why I'm stuck. Then I'll be able to work through the problem and get back to drafting and probably get another 10-15 thousand words done. I think people try and fit themselves into a mould, but if you're eight books in – and it's still not working for you . . . The newsletter means a lot to me. I've been doing it for over four years now, and before that I’ve given writing advice online for free for ten years. For the first two, no-one read it, but I stubbornly put it out there until people did. I think I'm a good teacher! And it's ultimately paid off – my first series didn't do well at all, and when the series was wrapping up I was in a tough position. The issue was, I had this huge online following through people consuming my writing advice. I didn't want to lose the name and following [I’d built up]. Eventually we found a wonderful publisher – Tor Teen in the US and Tor UK – who took a chance, despite my terrible sales record. And the amazing thing is that because I'd been talking about my writing, filtering it through Truthwitch, the readers of my advice became invested in that book, seeing it from inception to print, and so they showed up and they bought it, propelled me to the NYT best-seller list and saved my career, and also launched it. So I love my newsletter and newsletter followers! With war sweeping the witchlands and tainted magic destrying friends and enemies, loyalties will be tested as never before in the third book in Susan Dennard's series. Aeduan and Iseult race for safety, desperately trying to evade the Raider King, while assists an empress uncover a rebellion. Will the two friends ever be reunited? And will their powers bring peace to the witchlands?